Sarah Mangelsdorf recalls vividly how her professor father would bike uphill to campus on his three-speed, his crimson and gold robe flying in the breeze. “He was the marshal of commencement for 25 years and I still love hearing ‘Pomp and Circumstance,’” she says. Mangelsdorf’s deep-seated devotion to undergraduate education is readily apparent. A third-generation academic, her grandfather was a plant geneticist at Harvard; her father taught physics at Swarthmore and worked summers at the Woods Hole Oceanographic Institute. Mangelsdorf, a psychology professor, just completed four years as Dean of the College of Liberal Arts and Sciences at the University of Illinois at Urbana-Champaign (UIUC), the first woman to hold that position. In August, she brought her enthusiasm and experience to Weinberg College as its new dean. At Weinberg, she succeeds Aldon Morris, the Leon Forrest Professor of Sociology, who served as Interim Dean for the 2007-08 academic year. Mangelsdorf says she is especially excited to assume the reins at Weinberg at a time so full of promise for Northwestern, a school whose progress she has been watching for some time. 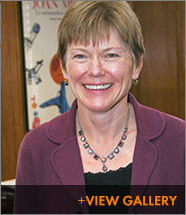 While at UIUC she won several teaching awards, including the William Prokasy Teaching Award in 1998, the college’s highest award for teaching. She is also an internationally known scholar who studies the socio-emotional development of infants and young children. Throughout her career she has blended her teaching and research to promote the intellectual growth of both undergraduate and graduate students while furthering the understanding of human development. “What's been most rewarding for me over the years,” says Mangelsdorf, “is having the undergraduates whom I’ve had in class and who have worked in my lab go on to graduate school in psychology, social work, medical school and law school and then on to productive careers. At Northwestern, students have all the great research opportunities you get at a world class research university, yet they also have smaller classes in which the faculty really teach undergraduates. The admissions literature is right: you really do get the best of both worlds at Northwestern. As someone who has always cared deeply about the teaching and mentoring mission of the university, I feel this is a great fit for me.” She continues to mentor graduate students in psychology and has already given a number of guest lectures in the psychology department. Weinberg's recent deans have been from the fields of literature, biology, and sociology. What does Mangelsdorf, as a psychologist, bring to the table? “I think that nationally, psychologists are over-represented in higher education administration,” she says. “If you’re interested in human behavior and what motivates people, you might be more drawn to administration than someone who doesn’t find interacting with people all that interesting. "I study family systems," she says. "As I first became dean I noticed how some of the organization principles we think about in family systems also operate in academic institutions and departments. "In a healthy organization, people need to express disagreements in a way that is not destructive. When I think of a functional, healthy department, I see graduate students who are well trained and have a high degree completion rate, and a high percentage of assistant professors who thrive, get tenure, and actually stay at the university. It often comes back to these basic things: being collegial, being fair, listening to people, and letting them have a voice." Not surprisingly, former colleagues describe her as an excellent listener, open to new ideas, and sensitive to many sides of an issue. "Sarah has been a great dean because she understands that the college is ultimately a community of people," says Karen Carney, associate dean in the College of Liberal Arts and Sciences at UIUC. "You can see it in her ability to converse with anyone on any subject, whether they are freshman students or potential donors, student employees or visiting dignitaries." She points out Mangelsdorf's encyclopedic knowledge of every one of the school's 700 tenure line faculty, including the names of their spouses and children. She has been especially good at development work, doubling the amount of private donations. Once, says Carney, she drove across the state of Florida to meet with one donor for lunch, and then back across to meet with another donor for dinner. Since few people, as children, set out to become college deans, we asked the new dean to trace her career path. She first wanted to be a clinical psychologist, earning her bachelor's degree in psychology in 1980 from Oberlin College and her doctorate in 1988 in child psychology from the University of Minnesota. “As a case worker at a community mental health clinic after college, I loved to go back and read the files and find out what a person was like as a child,” she recalls. “I’d look for early signs of risk of significant mental health problems. In the end I decided I was more interested in studying human development and the development of personality than I was in treating adults with chronic mental health illness.” So she became a lab coordinator for Dr. Elizabeth Spelke at the University of Pennsylvania doing research in early cognitive development, and, ultimately, going on to get her PhD in developmental psychology with an emphasis on social-emotional and personality development. After graduate school, she went to University of Michigan as assistant professor, and then ultimately, she and her husband, Karl Rosengren (also a developmental psychologist, who has joined the Northwestern faculty), both accepted positions at University of Illinois. Although both Michigan and Illinois are large research universities, Mangelsdorf’s passion for teaching and mentoring, as well as for research, stood out. “Because of my interests, I was often asked to be on various departmental, college, and campus committees,” she says. Those responsibilities led to first serving (at UIUC) as Associate Head of Psychology, Associate Provost for Undergraduate Education and Head of the Psychology department before becoming dean. Mangelsdorf says her first order of business at Weinberg is to conduct ethnographic research, as a cultural anthropologist would. “I am trying to understand the departments and their cultures and their histories, as well as the College’s own culture and history and practices.” This is a tall order. But Mangelsdorf ably managed an even greater number of students and departments at Illinois, while dealing with the severe budget restraints which affect state-funded schools. Clearly, her experience has served her well. In her first few months she has impressed a number of her constituencies—faculty in departmental meetings, the Student Advisory Board, her own staff—with her knowledgeable questions and her keen interest.